Nancy Sickbert-Wheeler works in the medium of vitreous glass enamel also known as glass on metal. Her combination of metalsmithing and enameling techniques strives to create works of art jewelry that are both ancient and modern in feeling. Historical etchings of natural, botanical and aquatic forms inspire the framework for her enameled creations. These patterns are acid etched onto copper and silver which are then hammered and shaped into contoured forms. Relying on basse-taille and champleve technique, the etched image is imbued with visual depth and mystery through the challenging art of combining both transparent and opaque enamels within the recesses and surfaces of the metal. The enamels are set with bezels or prongs of silver or gold in simple or layered jewelry environments. Nancy's unique work has received a variety of commissions ranging from film documentaries to religious vestment pieces to civic award sculptures. She is an award winning participant in various art fairs throughout the country. A respected teacher of metalsmithing at the Evanston Art Center in Evanston, IL and the Highland Park Art Center in Highland Park, IL, Nancy also conducts workshops throughout the greater Chicago Area. Educated at Chicago Academy of Fine Art, The School of the Art Institute of Chicago and the University of Oklahoma, she has been designing and fabricating jewelry for twenty five years. 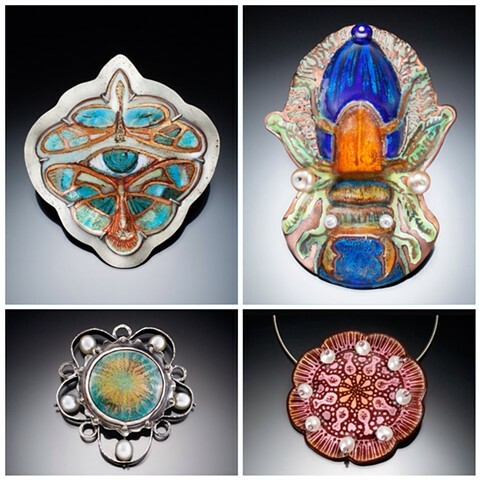 Enameling in particular has captured her heart for the past fifteen years.